This document (created Oct 5, 1996) is intended to serve as an immediate resource for those interested in BEAM robotics. The latest and original version of this FAQ (Frequently Asked Questions) can always be found at http://people.ne.mediaone.net/bushbo/beam/FAQ.html. If you have suggestions and comments write me at bushbo@mediaone.net. Thanks. What is a simple example of BEAM robotics? What is a Nervous Network? Is the mailing list archived? What publications are available that discuss BEAM robotics? Where can i find electronic and mechanical parts? What are the skills required to build BEAM machines? What kind of technology is in these machines? What is the next step in the evolution of BEAM robotics? What are some cool web sites to check out? Are there any BEAM Robotics groups? When is Mark W. Tilden publishing his books? A Course of Study in BEAM Robotics? ...The science behind the idea stems from current concepts in artificial intelligence (AI), artificial life (ALife), evolutionary biology, and genetic algorithms. It seems that building large complex robots hasn't worked well, so why not try to evolve them from a lesser to a greater ability as mother nature has done with biologics? The problem is that such a concept requires self-reproducing robots which won't be possible to build (if at all) for years to come. A solution, however, is to view a human being as a robot's way of making another robot, to have an annual venue where experimenters can let their creations interact in real situations, and then watch as machine evolution occurs. In other words, robogenetics through robobiologics. The solar engine write-up by Brian Bush (me). BEAM solar engine plans - rather old version, but it encapsulates the basic idea. This set of plans contains the basic solar engine circuit and also the physical layout to free-form a solar engine (it is right above the circuit diagram). For some ideas on mechanical layout and structure, see the Solarbotics picture archive of BEAM machines. A real-time non-linear analog control system emulating a low-level peripheral spinal system. Based on arrays of sequential RC (Resistor-Capacitor)-time-based pulse delay circuits in closed loops, a Nv net is any circuitry that can act as a media for sustaining independent control "processes." The individual "neurons" are based on self-reseting differentiators with an avalanche gain greater than their decay value. The "networks" are simply these neurons connected in the loops whose patterns are laid out in the paper, Living Machines. Nervous Net (Nv) technology is a non-linear analog control system that solves real time control problems normally quite difficult to handle with digital methods. Nervous nets are to Neural nets the same way peripheral spinal systems are to the brain. This work has concentrated on the development of Nv based robot mechanisms with electronic approximations of biologic autonomic and somatic systems. It has been demonstrated that these systems, when fed back onto themselves rather than through a computer-based pattern generator, can successfully mimic many of the attributes normally attributed to lower biological organisms. Using Nv nets, highly successful legged robot mechanisms have been demonstrated which can negotiate terrains of inordinate difficulty for wheeled or tracked machines. That non-linear systems can provide this degree of control is not so surprising as the part counts for successful Nv designs. A fully adept insect-walker, for example, can be fully controlled and operated with as little as 12 standard transistor elements. See below for more information. For information on constructing such a device, see What is a MicroCore? and the BEAM Tek page on nervous networks. Generic term for the closed-loop implementation of a nervous net responsible for direct actuator control in a Biomech robot. The term Microcore generically refers to any Nv core greater than equal to four, but specifically such cores are described by a numeric prefix. They are, in order, Monocore, Bicore, Tricore, Quadcore (the most common form of Microcore), Quincore, Hexcore, Septcore, Octacore, etc. An excellent write-up on How to build a Microcore Walker by Andrew Miller. See the Nervous network page from BEAM Tek for Microcore information, debugging and tips. One of many applications by Tilden: Yuma Proving Grounds Automatic UXO Detection using Biomorphic Robots from Minesweepers, May 94. The Hextile is a Nv specific protoboard designed to take advantage of various symmetries in Nv circuitry with tons of spare pads for additional circuitry, sensors, and mounts. The Hextile boards were made in several variations as a research tool, by and for Mark W. Tilden. Hextile boards are single sided square and hexagonal boards that come pre-arranged in sheets to provide the most convenient collections of biomech components for walkers, etc. There are over seven different sets of them now and, alas, even the cheapest of them costs between three and nine dollars per single board, up to $98 per sheet (quantity 50 x 30 boards each, so that's with the discount). The black substrate used makes the devices easy to debug for shorts and evaporates moisture away quickly (for washing away water-soluble flux), while the triple-thick gold clading makes for high reliability and easy soldering. The boards are not just component holders but designed as structural elements to hold the robots together with the smallest and most reliable adhesive currently known: 60-40 solder (Tilden's experience). Tilden designed them like this so they'd be easy to work with, cool to display, easy to connect, and so they'd last. When you're talking bugs with a 10 year life expectancy, you want your controllers to be the least of your problems. So far, that's been the case. Details on these boards will be included in the upcoming book Principa Robotica with a detailed explanation on what does what and why. They will become public domain after the publication, but not now only because the documentation isn't finished yet. If it works out, Tilden is hoping hextiles will be a stock item with one or more of the BEAM saleshouses. A picture of Hextile Nv board (Hx 1.0) along with a Driver Hextile (Dx 1.1) that compose Bigfoot is here. Containing circuitry specific to my micro-power transistor H-bridge and (gak!) Happy Birthday Controller module timer (now very, very, very obsolete). A general purpose motor and etc. driver board using the 74245 Octal Driver. The 1.1 features better use of the chip enable so that such boards can be stacked to act as motor multiplexers. The Sx board is a square Nv hextile which can fit along on of the edges of a regular, larger hexagonal tile. The '+' board is a 4 or 8 element switch device for sensors and microswitches. Two triangular boards, the first a Capacitor Module (cm), and the second a single Switch Module (sw), compatable to the edges of hexagonal tiles. Designed to act as power and signal bridges along the edges of joined hextiles. Designed as a LED, switch and power board, it exists to complete the full range of geometric primitives in the Hextile line. The Hx range of boards were designed for modular experiments in Nv topological connections i.e. : how to connect Nv circuitry together to build more capable brains and bodies, and have been the staple tools of my Nv work for the past two years. Hx tiles can be assembled into any structure known to Euclidian geometry, and are sturdy enough to mount both electronics, battery, sensor, and motor mechanics right on the boards. There are over 300 people now on the list, from all over the world. If there are any questions about this email list, please see this document About the BEAM e-mail list by Mark Dalton mwd@cray.com. Yes, the current mailing list archive is at http://www.webconn.com/~mwd/beam/mlist/beam/beam.html. There is also an old archive has messages up to late 1997, which is somewhat useful for those wishing to browse old articles. The old archive is at http://www.webconn.com/mail/beam/ and is archived by thread. Messages before July, 1997 are here. You can search the mailing list archive by using a search engine, such as Hotbot with the following parameters Modify-must contain "BEAM", the Location-CyberPlace "www.webconn.com" and enter your search text (e.g., Solar). This basically narrows the search domain to the www.webconn.com domain (and only documents that contain beam@webconn.com, such as the archived list emails). Biomorphic Robots and Nervous Net Research: A New Machine Control Paradigm - From the EANN '95 Conference Proceedings "Special Track on Robotics"
Layman's version on Nervous Networks by Andrew Miller. See Mark W. Tilden's patent, (or the local version) No. 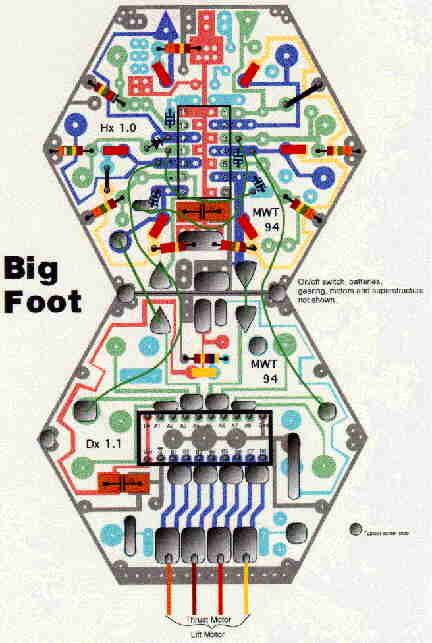 5,325,031: Adaptive robotic nervous systems and control circuits therefor issued on June 28, 1994. ABSTRACT: A self-stabilizing control circuit utilizing pulse delay circuits for controlling the limbs of a limbed robot, and a robot incorporating such a circuit, are provided. The pulse delay circuit acts as an artificial "neuron" which drives servo motors according to a selected sequence which is reconfigurable in response to signals from local or remote sensors. Also disclosed is a pulse neutralizing circuit which can be used to stabilize and reconfigure sequencing loops and chains incorporating the pulse delay circuit, and which can modify the actuation processes controlled thereby. Check out the US Patent Database (brought to you by IBM) to see related and referenced patents, such as No. 5,574,347: Apparatus for locomotion in enclosed spaces (which references Tilden's patent). Mark W. Tilden and Brosl Hasslacher's paper entitled Living Machines (this document is a Adobe Acrobat PDF file), "ROBOTICS AND AUTONOMOUS SYSTEMS: The Biology and Technology of Intelligent Autonomous Agents", LANL Paper ID: LA-UR-94-2636, Spring 1995. A detailed analysis of the master-slave bicore is given in a paper written by Suzanne Stills and Mark Tilden which is available from her site. See the BEAM literature list, which lists other sources for BEAM literature. The list is getting a bit dated now. See the Department of Energy Information Bridge, there under Advanced Search, search for Author = Tilden. You should see four or so papers in PDF along with text abstracts. Mobile Robots : Inspiration to Implementation - This is one of the most complete and up-to-date robotics text! Out of Control: The New Biology of Machines, Social Systems and the Economic World - A nice general book on Artificial Life. Artificial Life - Similar to above. Darwin among the machines - A nice twist to where artificial life is headed. Solarbotics - Kits with step-by-step instructions and all of the parts you need. On-line resources - Magazines, newsletters, Electronic/mechanical parts and surplus stores on-line. Mondo-tronics' Robot Store, has Nitinol Kits, 1995 BEAM Games Guidebook and Solaroller do-it-yourself kits. There are many sources for BEAM parts. The best way is to just start collecting techno-scrap (printers, floppy drives, etc). You can also keep an eye on wholesale distributors for good prices on stuff. Below is a list of some parts for major components (and some sources) needed to build a BEAM walking machine (and other BEAM bots). Resistors - Make your first MicroCore with 'larger' values like 0.22uF caps and 10.0 megaOhm resistors. Capacitors - Make sure that you are using non-polarized caps; "monolithic" work well as they are fairly small. 0.1 microfarad and 0.22 microfarad are two values that work well. Resist the temptation to use larger capacitors. Low-current LEDs, get a handfull of low-current LED's to use for debugging. These are the LED's that operate at 1.0 to 2.0 mA instead of 10 to 20 mA. Use larger than usual current limiting resistors for the LED's. Solarbotics - Pictures of what others have built to spark your imagination. Simple, yet elegant solutions: "a variety of robotic devices with adaptive nervous systems not exceeding the equivalent of 10 neurons. These devices not only learn to walk from first principles but can also adapt to many different circumstances including severe personal damage. There are no processors involved; my most complex device uses only 50 transistors for its entire spectrum of behavior, response and control." "any of a variety of transistors, common hex-inverters, and/or inverting bus drivers, ranging in price from 8 cents to $1.24." Vision. Mark's (Tilden) been doing some neat work with foviation, building light-seeking vision/head mechanisms powered by Nv technology. Hygene. If you consider the problems of an autonomous machine with an extreme lifetime, the big question is how to keep yourself clean so that your performance remains constant. The sleek look and grooming habits of insects is to optimise this characteristic. We can make machines robust against such things (teflon wire insulation on many surfaces), but what does this mean when you've got dirt splattered on your sensors? Make a machine that can negotiate mud in the rain and still keep track of itself, and you're well on the way to an advanced life form. More recently Tilden has been doing some advanced work into the nature of minimal cognitive architectures. Better brains for BEAM bodies involving Nv arrays, some with hundreds of neurons. The resulting robots will be... big. Solarbotics - Great inexpensive kits and BEAM parts to teach you the basic skills to build a ecosystem of robots. Nice picture archive of BEAM robotics. AM Inovations by Andrew Miller - A great explaination of microcores, and lots of other great information - a must see! PiTronics by Steven Bolt - An example of building a photovore and a walker (Spider). Links collected by Jonathan Cline (and his labbook. A.A. van Zoelen's page on robotics. Chiu-Yuan Fang's site with BEAM related news. Terry Newton's site with some cool ideas. Robots from Rubbish from Wired Magazine. April 16th - April 18th, 1998 - BEAM Workshop in Los Alamos (at Los Alamos High school) [10:00AM - 4:00PM] note: no entrance fee. March-April 1998 issue of the American Scientist magazine - Brief article entitled "Little Robots in Space," which is about inexpensive satellites that are being built and experimented with by a group of three scientists: Kurt Moore, Janette Frigo and Mark W. Tilden. Monthly - Northern New Mexico Robotics meeting. Contact Mark W. Dalton at mwd@cray.com. If anyone wants to list themselves here to hold some group meeting, or build-fest, email me contact information and city. A listing of people interested in forming a BEAM group in their area is here. Living Machines, MIT Press. Primarily a philosophy book with some plans. Principia Robotica, MIT Press. BEAM engineering tech with examples. A Dream of Stars, Blantine books. Fiction - Tilden's first attempt at BEAM Sci-fi. Explorations in the Robot Jurassic Park, MIT Press. Primarily a coffee-table gloss-picture book of Tilden's designs. Can't wait, well the following is a section on Biomech Motor Bridges from a draft of the book, Principia Robotica. Hope to have a Table of Contents up here when it gets to me, so watch this space. (6) onto the construction of a microcore walker. Of course, this is only my opinion, but it begins with the simple and moves to increasingly complex designs. In all, start simple and work your way up. Since practice makes (*almost*) perfect, build, build and build. All along you should continuously search for parts and junk. I have always found a good way to build neat devices is take mechanisms you find in nature and in high-tek and try to replace them with nervous networks and solar engines. Example: a stepper motor usually has a computer as a controller. Why? Well because of the somewhat complicated patterns needed to drive the motor it is usually easier produced by a computer (program). The action of controlling a stepper motor can be performed by loops of nervous networks. Of course, this is not the most efficient manner, but it can be done. You will be amazed at the type of behavior you can get from simple loops of circuits, and it doesn't always have to be formed or embedded as a robot. Always buy sets of things, so you can experiment and sometimes unfortunately destroy parts. 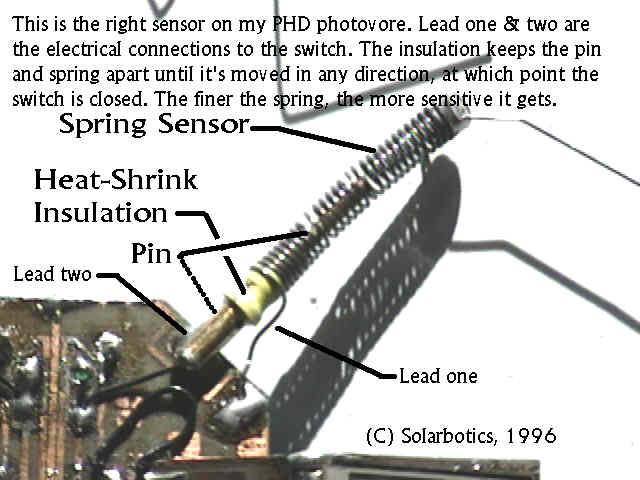 Note: I am assuming you know basic electronics (see Forrest Mimms' Basic Electronics) and how to solder. along with others on the BEAM email list.